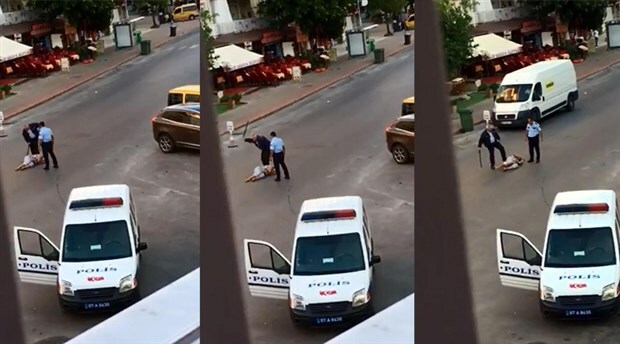 A cellphone video that shows two police officer in Antalya repeatedly striking a woman with baton has prompted investigation, authorities announced on Wednesday. According to the 45-sec. footage which was recorded by a passersby and released on Twitter, two several officers and a woman exchange a series of escalating insults and challenges, and the brawl ends up with officers repeatedly strike the woman on the upper part of her body and her head. The video posted on Twitter doesn’t show what led to the incident. The whereabouts of the woman is unknown. According to the Birgün daily, the victim was a foreign national and an investigation has been launched into the incident by the Antalya police department. The two officers were suspended.